Cook orzo pasta according to package directions; drain and set aside. While the pasta is cooking, sauté onions and broccoli in olive oil until tender over medium heat (at least 10 minutes). When broccoli is done, add spices and salt and pepper; stir to combine. Mix in the yogurt in with the broccoli and remove from heat. 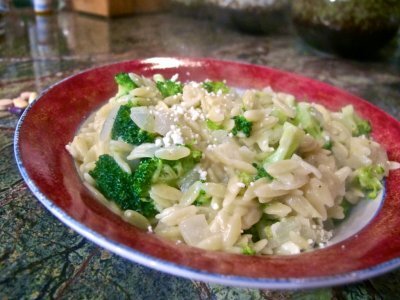 Combine broccoli mix and orzo together until combined and creamy. Serve hot… Enjoy! This entry was posted in Appetizers & Sides, Entrée, Italian, Pasta, Vegetarian on January 17, 2014 by Miranda @ Tempest Books. In a large pot, cook beef and garlic over medium-high heat with canola oil. Meanwhile, make the Alfredo sauce. Turn the heat down to low and add flour. Start whisking immediately, and continue for about 1 minute. Slowly (very slowly) add milk to the flour mixture, whisking continuously for about 3 minutes. Add parmesan cheese to the pan and continue whisking until sauce thickens up. Turn off the heat and add salt, pepper, and cayenne. Mix together the pasta, tomato sauce, Alfredo, red pepper flakes, and parsley into the pot with the beef. 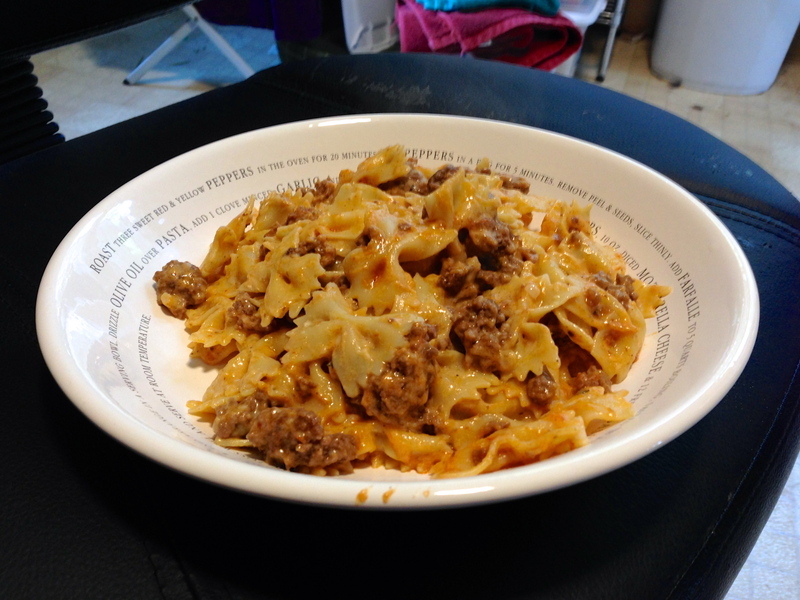 This entry was posted in Beef, Entrée, Italian, Pasta on January 17, 2014 by Miranda @ Tempest Books. Generously season chicken breasts with salt and pepper on both sides. Lay breasts flat on a baking sheet lined with foil and greased with cooking spray. Bake breasts until done, but still moist (about 15 minutes). Cook pasta and broccoli according to package directions. Meanwhile, chop chicken into bite-size pieces and set aside. Sauté garlic in a saucepan over medium-high heat in olive oil. Add whole wheat flour to garlic and whisk for 2 minutes, forming a roux. Slowly whisk in chicken stock, yogurt, milk, nutmeg, salt and pepper. Bring sauce to a boil, then reduce to a simmer. Continue to let sauce boil for 3 more minutes, until it thickens. Stir in cheese and remove from heat. 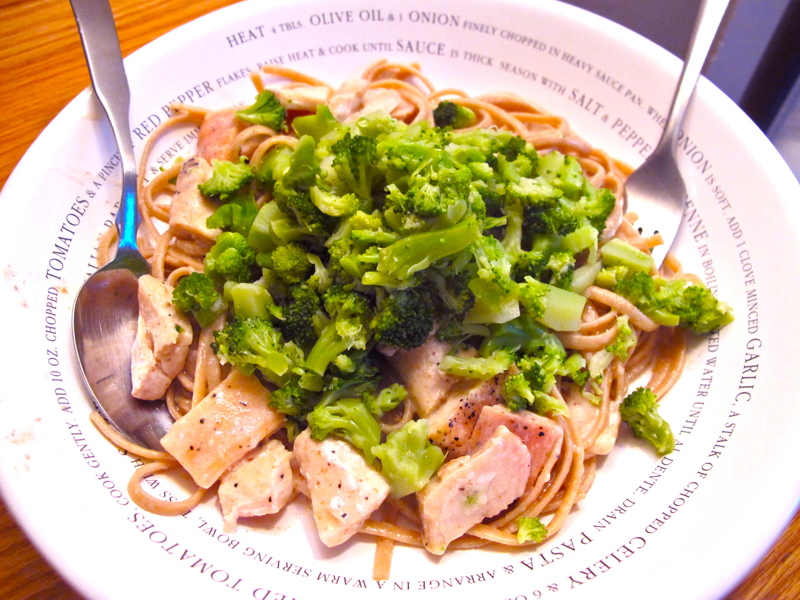 Add cooked pasta, chicken, broccoli and sauce to the same pan and stir until fully incorporated. This entry was posted in Chicken, Entrée, Italian, Pasta on January 17, 2014 by Miranda @ Tempest Books. Pour the risotto in a saucepan with 1 cup of vegetable broth. Cook on medium until boiling. Stir the rice and lower heat until broth is absorbed. Add salt and 1 more cup of vegetable broth. Sauté vegetables with olive oil and salt for about 5 minutes until tender. Let vegetables drain in a colander. When rice has absorbed the broth, add the last cup, stirring until absorbed. 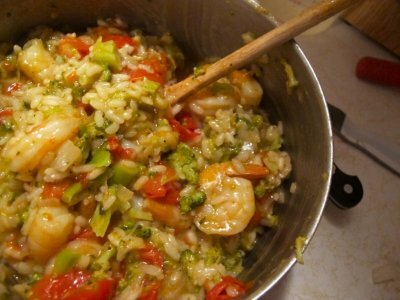 Add shrimp and vegetables to the risotto. 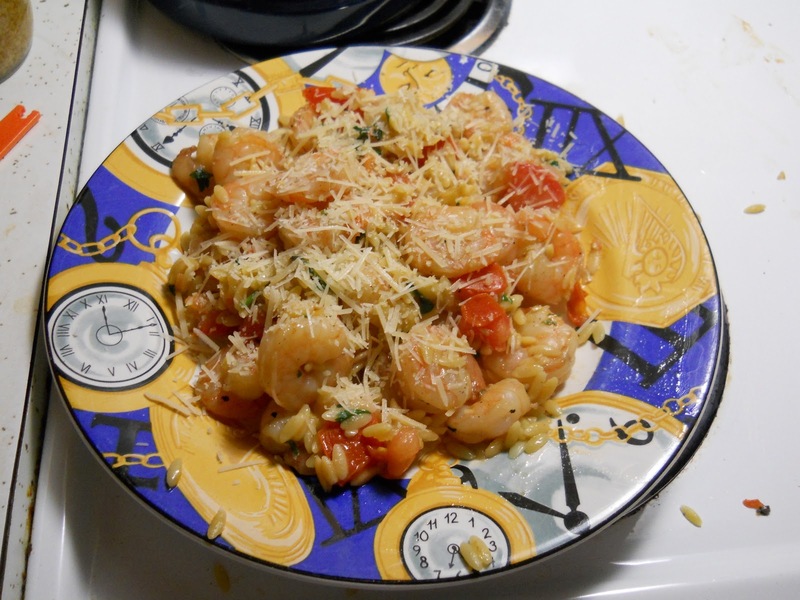 This entry was posted in Entrée, Italian, Pasta, Seafood on January 17, 2014 by Miranda @ Tempest Books. Cook the pasta according to package directions, omitting salt and fat. While pasta cooks, heat 1 tablespoon oil in a large skillet over medium-high heat. Sprinkle 1/2 teaspoon of salt and 1/8 teaspoon of black pepper evenly over shrimp. Add shrimp to pan; cook 1 1/2 minutes on each side or until done. Remove from pan. Add remaining 1 tablespoon olive oil to pan. Add onion, garlic, and red pepper; cook 2 minutes, stirring frequently. Add tomatoes, and cook 3 minutes or until tomatoes begin to soften, stirring occasionally. Stir in pasta and shrimp; cook 1 minute or until thoroughly heated. Remove from heat, and stir in 1/4 teaspoon salt, 1/8 teaspoon black pepper, cheese, and basil. Cook pasta according to package directions; drain and set aside. Meanwhile, sauté garlic in oil over medium-high heat in a sauté pan. Chop sausage into bite-size slices and add to pan. Cook sausage until golden-brown on the outside; drain and set aside. Using the same pan, sauté peppers until tender (no need to add more oil). Using the pasta pan, add in peppers, sausage, marinara sauce, and pasta. Stir together until fully combined and serve with parmesan cheese on top. 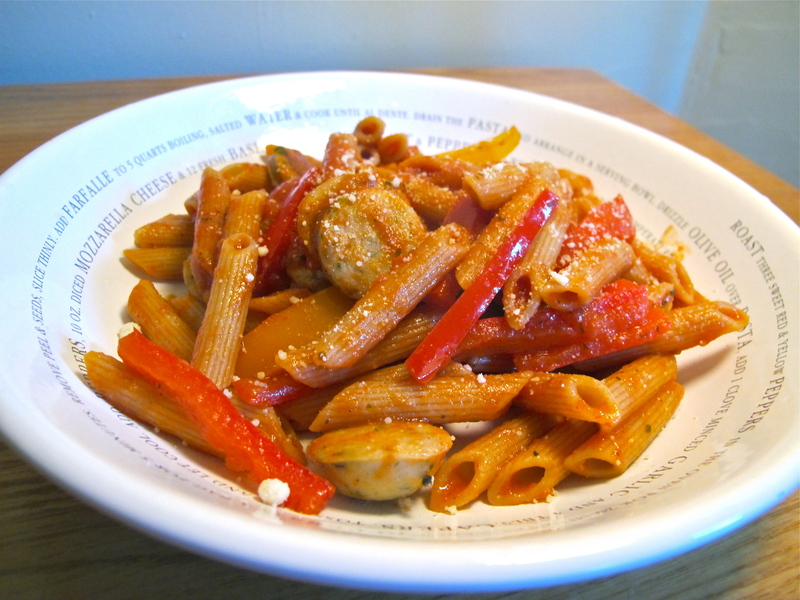 This entry was posted in Entrée, Italian, Pasta, Sausage on January 17, 2014 by Miranda @ Tempest Books. Sauté onions and garlic with canola oil in sauté pan over medium-high heat. Meanwhile, toss sweet potato with olive oil, salt, pepper, a dash of cayenne pepper, and paprika. Pour sweet potato onto a greased, foil-lined baking sheet and roast in the oven for 25 minutes, or until fully-cooked and crispy on the outside. Add arborio rice and red wine to the onion mixture; stir to combine (if omitting the wine, add 1/2 cup chicken stock). When the rice has mostly absorbed the wine, add 2/3 cup chicken stock; stir. Add more chicken stock once the rice has absorbed the liquid. Keep occasionally adding chicken stock and stirring, until almost fully cooked (will take about 25 minutes). Meanwhile, once sweet potato is done, remove from oven and put into a blender/food processor. Combine sweet potato with half and half until a thick sauce is made. When the rice is almost done cooking, add the sweet potato sauce and let the risotto absorb some of it. 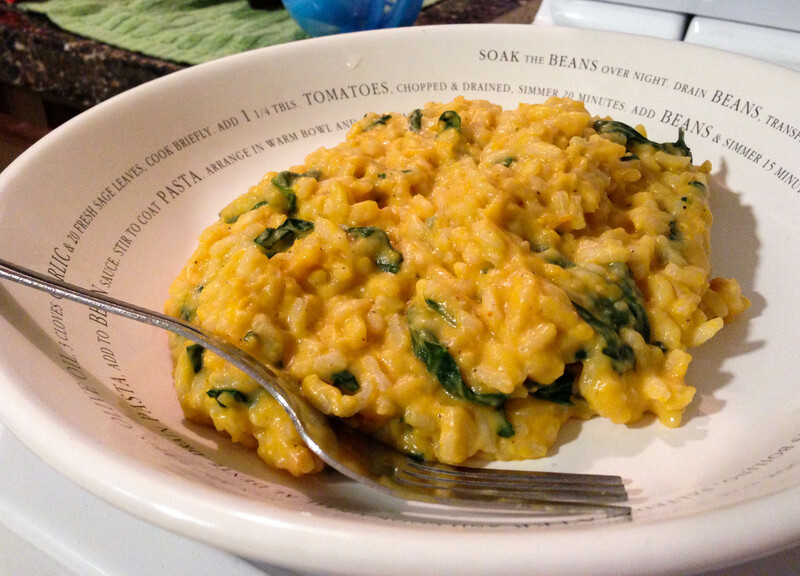 When the rice is fully cooked, turn off heat and stir in the spinach and cheese until the cheese is melted. Add more spices, if necessary. This entry was posted in Entrée, Italian, Pasta, Vegetarian on January 17, 2014 by Miranda @ Tempest Books.